The "Armory of the 124th Field Artillery, Thirty Third Division, Illinois National Guard" is located at the northeast corner of Washington Park at 5200 South Cottage Grove Avenue. The Unit’s motto, “Facta non verba” – Latin for “deeds not words” is inscribed high on the north wall. Today the Armory is known as the "General Richard L. Jones Armory," in honor of African American Brigadier General Richard L. Jones who commanded the 178th Regiment from 1947-1953. Sculpted figures designed by Fred Torrey represent the warrior through the ages - from ancient Greece to the World War I “doughboy warrior” depicted here. Fifteen feet tall, he’s remained unblinkingly vigilant since put on sentry duty in 1929. Perhaps this young American soldier imagined he’d be at his post for only a short while -commissioned as he was during the peaceful promise that followed the Great War’s end. But “the war to end all wars” was but a prelude to the bloodiest century in modern history. And so the doughboy remains here at his post. 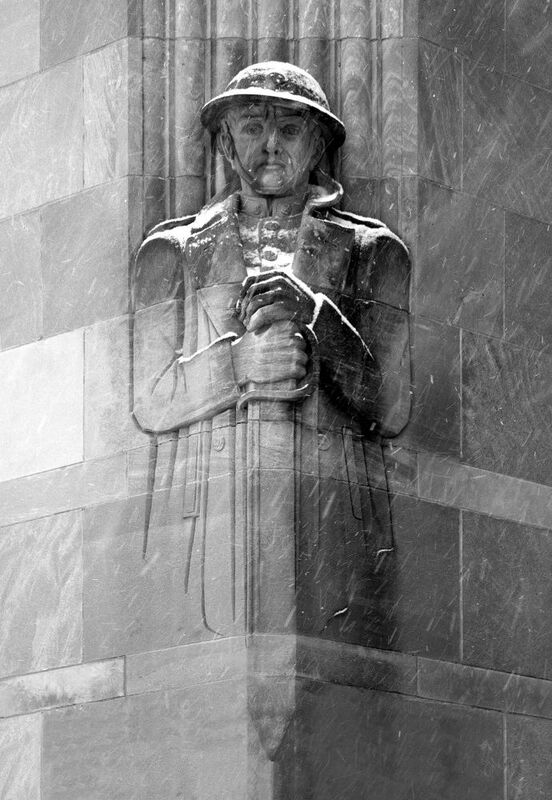 Perhaps it was the cruel weather upon him on the day this photograph was made, but he strikes me as sadly weary, still awaiting his relief. Perhaps this young American soldier imagined he’d be at his post for only a short while - commissioned as he was during the peaceful promise that followed the Great War’s end.